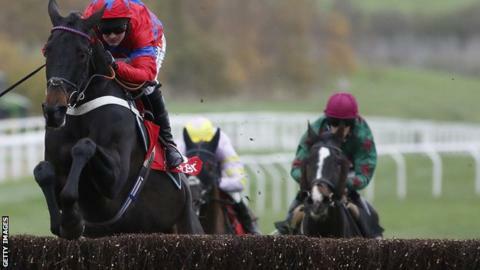 Sprinter Sacre won for the first time since April 2013 with a 14-length victory in Cheltenham's Shloer Chase. The nine-year-old former champion chaser did not race last year as he was diagnosed with an irregular heartbeat, and has had two second places in 2015. Jockey Nico de Boinville took his mount to the front at the fourth-last and surged clear to win from Somersby. At Punchestown, hot favourite Faugheen's 11-race unbeaten run ended as he was second to Nichols Canyon. Faugheen started the Morgiana Hurdle as a 1-6 chance but, despite finishing strongly, came home half a length behind his stablemate. Willie Mullins, who trained the first three in the race, said: "Faugheen was a little disappointing. Maybe he just met a good horse." Meanwhile, a jubilant crowd were thrilled to see Sprinter Sacre return to the kind of form he showed in 2012-13, when he won five Grade One races in a row, including victories at the Cheltenham, Aintree and Punchestown festivals. "This was as special moment as has been seen at Cheltenham in some time. "There have been occasions during his years "in the wilderness", to use Nicky Henderson's own words, that even the nine-year-old's most ardent fans flirted with scepticism about his future, but not the trainer who remained determinedly positive. "That faith was repaid today as the horse scooted clear like his old self to the noisy approval of the crowds. "It wasn't a return to the top - sterner tests will follow - but it was a decent-sized leap in the right direction." De Boinville, who won the Gold Cup on Coneygree in March, said: "It's just an amazing experience to finally get to ride him in a big event like this - we go back a long way." Trainer Nicky Henderson said: "He's taken to us to some amazing places over the years, but probably nothing anywhere like that was today. "It had to happen or otherwise the doubters would have been winning the argument and we had to come and do something." "The conditions of the race were in his favour. We're not all the way there, but we are going in the right direction."